The 28.04 metre sportfish motor yacht Flamingo Daze, listed for sale with Moran Yacht & Ship, has received a $795,000 price cut. Built in GRP by US yard Sea Force IX, she was delivered in 2010 as one of the yard’s very popular sportfish yachts. Accommodation for seven guests is suitably spacious and is laid out as three cabins consisting of a master suite, VIP suite and a guest cabin with side-by-side beds and an extra berth above. All cabins have Samsung LCD televisions and full en-suite facilities. Her very spacious saloon features large windows to allow plenty of natural light to flood onto her custom leather sofa. All of the appliances on this yacht for sale are top-of-the-line and custom stainless steel refrigerators can be found hidden beneath the counter tops. A dining table lies to starboard, providing seating for all six guests. Also in this room is a wine cooler and a state of the art entertainment system including a 46-inch Samsung television. Upstairs, the enclosed flybridge can be accessed from either the cockpit or from the saloon via a custom stairwell. This is a true command bridge with state-of-the-art electronics, custom flooring and plenty of storage. The separate crew quarters allow for a staff of up to three people. Twin 2,600hp MTU 16V 2000 M93 engines give her a top speed of 38 knots and a cruising speed of 28 knots. 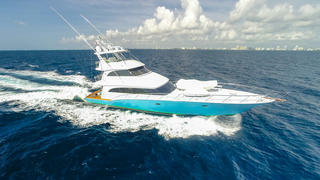 Lying in Fort Lauderdale, Florida, Flamingo Daze is now asking $6,200,000.